Pungent and fragrant ginger scents this succulent chicken and sauce. 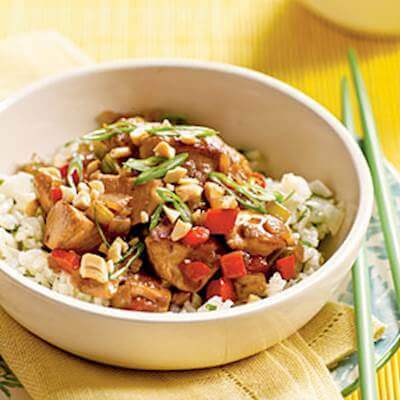 The Asian-inspired sauce made with honey, oyster sauce, soy sauce and sherry, gets toasty flavor from roasted cashews. Serve with rice or noodles. RecipeSavants.com Pungent and fragrant ginger scents this succulent chicken and sauce. The Asian-inspired sauce made with honey, oyster sauce, soy sauce and sherry, gets toasty flavor from roasted cashews. Serve with rice or noodles. Smart Recipes, Asian Recipes, Chicken Recipes, Recipes Chicken Asian Cashew Chicken PT15M Serves 4 Ingredients: 3 Tablespoons Low-Sodium Soy Sauce 2 Tablespoons Dry Sherry 4 Teaspoons Cornstarch 1 Pound Skinless Boneless Chicken Breast 0.5 Cup Fat-Free Less-Sodium Chicken Broth 2 Tablespoons Oyster Sauce 1 Tablespoon Honey 2 Teaspoons Sesame Oil 0.75 Cup Onion 0.5 Cup Celery 0.5 Cup Red Bell Pepper 1 Tablespoon Fresh Ginger 2 Cloves Garlic 0.5 Cup Green Onions 0.25 Cup Unsalted Dry-Roasted Cashews In a large bowl, add chicken, sherry, 1 tablespoon of soy sauce and 2 teaspoons of cornstarch and toss to coat well. In another small bowl, add broth, remaining soy sauce, remaining cornstarch, honey and oyster sauce and mix until well combined. In a large nonstick skillet, heat 1 teaspoon of oil over medium-high heat. Add chicken mixture and sauté for about 3 minutes. Remove from pan and keep aside. In another pan, heat remaining 1 teaspoon of oil and sauté bell pepper, onion and celery for about 2 minutes. Add garlic and ginger and sauté for about 1 minute. Add cooked chicken mixture and sauté for about 1 minute. Stir in broth mixture and bring to a boil. Cook for about 1 minute, stirring continuously. Remove from heat and sprinkle with green onions and cashews.